It really is an unbelievable record -- the previous record interval between major hurricane strikes on the US coast was six years; 4,301 days is almost double that. The last major hurricane, Category 3 or stronger, was Wilma on October 24, 2005. 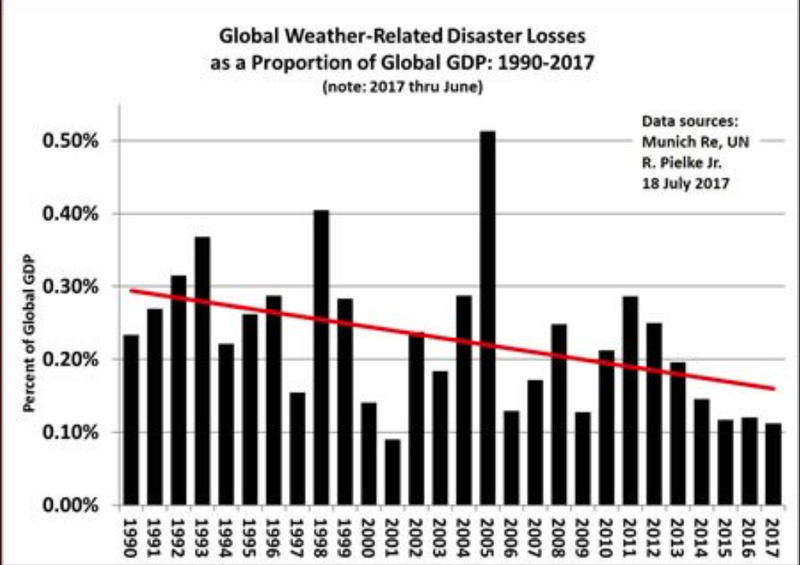 Here is a graphic from Dr. Roger Pielke, Jr. that shows it is a worldwide trend of lessening disasters. Dr. Pielke correctly points out that we will -- eventually -- revert to the mean which equals more frequent and intense disasters. As he asks, "Are we ready?" "Revert to the mean."? Who knows what the long-term mean is for storms? A century of data is a pittance. 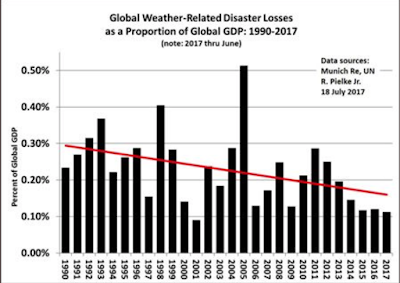 Second, as to the "mean" for losses as % of GDP: Most GDP growth is away from the most "storm vulnerable" areas (coasts), and the even on the coasts, the very nature of "progress" is to build more storm-resistant economies. Together, these factors may actually support continuation of the downward slope in losses as % of GDP. Look on the bright side! You are correct as far as % of GDP but there is no doubt that major hurricanes will return to the US coast. Here in Houston we remember Ike in 2008 as a Cat. 3. Better check your records. Ike was a Category 2.